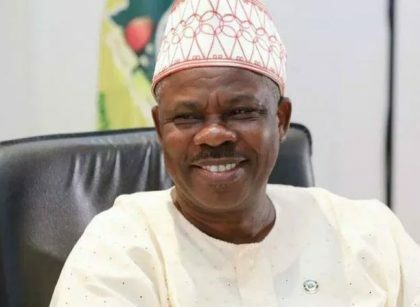 Ogun governor Ibikunle Amosun has emerged the candidate for Ogun Central senate race, as he and elders of the All Progressives Congress, unveiled consensus candidates for National Assembly. Amosun was the holder of the Ogun Central Senate seat between 2003 and 2007, but this time around, he will be displacing the incumbent, Lanre Tejuoso. The announcement was made at the Presidential Lodge in Abeokuta on Tuesday. Six out of the nine candidates for the House of Representatives were also announced. Apart from Amosun, other adopted candidates for the Senate are Chief Lekan Mustapha (Ogun -East) and the Chief of Staff to the state governor, Mr. Tolu Odebiyi (Ogun- West). Mustapha was also the holder of the seat between 2007 and 2011, as a member of the Peoples Democratic Party. The six adopted candidates for House of Representatives seats include the Speaker of the State House of Assembly, Suraj Adekunbi (Egbado North/Ipokia); former chairman of Ado-Odo/Ota, Mr. Rotimi Rahman(Ota); the State Commissioner for Special Duties, Mr. Leke Adewolu(Ewekoro/Ifo). Others are the Director General of Bureau of Lands, Mr. Biyi Ismail (Ijebu North/Ijebu North-East/Ogun -waterside); Mr. Biyi Otegbeye (Egbado South /Ipokia) and Hon. Mikail Kazeem ( Abeokuta North/Obafemi-Owode/ Odeda). The governor described the reactions as ” the beauty of democracy” and told aggrieved members to wait until the time of primaries when the party would finalise all issues. Amosun had explained that Akinlade had emerged among other nine aspirants from the Ogun-West Senatorial District to which the party had zoned the governorship seat. However, elders of the party from the Ogun -East Senatorial District dissociated themselves from the purported zoning arrangement to Ogun-West Senatorial District and had since unveiled the state Commissioner for Commerce and Industry, Mr. Bimbo Ashiru, as the consensus candidate from the area. Mr. Dapo Abiodun, a governorship aspirant from Ogun East has also kicked against the arrangement. The bloc is claiming the right to produce the successor to Amosun based on the principle of power rotation in the state.